Habitat: Onion is native to South-West Asia. Description: Onion is a biennial plant, growing from a subterranean bulb. It can grow up to 70 cm in height. It has an erect stem and an umbel of soft, white to pink flowers on its top. Its underground bulb carries small, shallow roots. Useful components: Calcium, iron, phosphorus, vitamin C, riboflavin, niacin, thiamine, carotene. 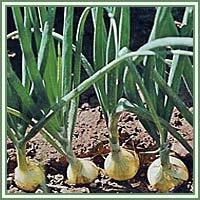 Medicinal use: Onion has a great variety of medicinal uses. It is considered to have anthelmintic, antioxidant, antiseptic carminative, diuretic, expectorant, febrifuge and vulnerary properties. 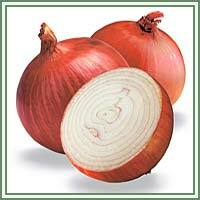 Onion is said to help in cases ranging from the common cold to heart disease and diabetes. In traditional medicine, Onion had been used for colds, coughs, flu and bronchitis. During winter times, onion juice sweetened with honey can be used as prevention against cold. It is also said that chewing on fresh Onion can kill germs in mouth and soothe toothache. Recent studies are showing its beneficial effect in the treatment of high blood pressure and high blood cholesterol. It can be a good prevention against cardiovascular disease, and even certain head and neck tumors. Some studies suggest that high consumption of Onion, along with Garlic lowers the possibility of appearance of stomach cancers for 40 %. It can also be used as prevention against osteoporosis and in treatment of blisters, boils and topical scars.